Bonifas, Robin P., Bullying Among Older Adults: How to Recognize and Address an Unseen Epidemic, (Baltimore: Health Professions Press, 2016). Bonifas, Robin, “Bullying Among Older Adults: An Unseen Epidemic,” (infographic) Health Professions Press. Frankel, Marsha, “Combatting Social Bullying Among Older Adults,” webinar, posted March 7, 2013. Duffy, Maureen and Len Sperry, Mobbing: Causes, Consequences, and Solutions, (New York: Oxford University Press, 2012). Duffy, Maureen and Len Sperry, Overcoming Mobbing: A Recovery Guide for Workplace Aggression and Bullying, (New York:Oxford University Press, 2013). 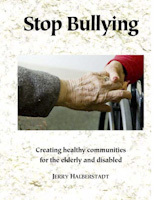 Halberstadt, Jerry, "Stop Bullying Workshop," December 13, 2016. The workshop was hosted by Michael Kane, Director of the National Alliance of HUD Tenants and by Damainique Bruce, JD. The session was part of a monthly training series for volunteers in the VISTA Affordable Housing Preservation Project under the auspices of the National Alliance of HUD Tenants. A recording of the session, including a short presentation on substance abuse and housing by Aubrey Esters, is available at https://recordings.join.me/9UlVvLQ_Nk2FLNsRxjZ_fw Halberstadt's talk begins at ~14 minutes into the recording.The working paper, "Stop Bullying Workshop," is available as a PDF file, please use the contact form http://stopbullyingcoalition.org/contact and include your email, name, affiliation & basis for your interest, and your zip code.